Hi Kitty. What a cute tablescape. I have the same little Texas bear. The raspberry pie looks awesome and cool. You are lucky that your flowers are rebounding. Some of mine are starting to dry up before my eyes in this heat! Have a good week! Another yummy dessert. Is the temp in the triple digits there? We might be getting a 90 degree day this week. That looks perfect for a hot day's dessert! Yummy! I love your quilt topper...and aren't our sweet blogging friends wonderful? Hope you survive the heat...the pie will help, I am sure! Thanks so much for linking to Tuesday Cuppa Tea! Yum! Your pie looks delish, Kitty! This would be so easy for when my family comes home next month. I am going to copy it. Your teddy bear in the wagon makes such a cute vignette. Thank you for sharing and Happy first day of Summer! Kitty, I'd like a slice of that refreshing pie right now. Yummy! Your setting is sweet too. I have one of those little wagons. They are fun for summer tables. 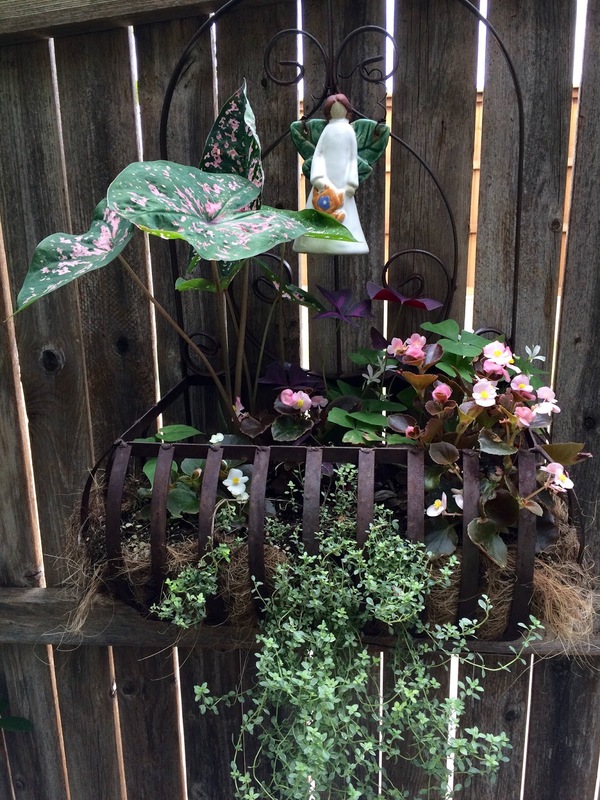 Thanks for sharing the adorable vignette and the recipe. We're having a taste of your Texas heat today with temperatures in the low 90's. Wow, this definitely called for the AC. Your whipped pie looks delishious (like everything you make) and will be a cool and refreshing dessert for us too. Your photos are always so charming, my friend. I love how you displayed the candle and the doily peeking out of the wagon is stunning! Wishing you a beautiful week. Stay cool! Love to you! You make delicious foods and have nice vignettes! I think I will get out some of my 4th things this week. Hi Kitty, well now I am truly hungry for this yummy dessert. What a wonderful treat on a hot day!! 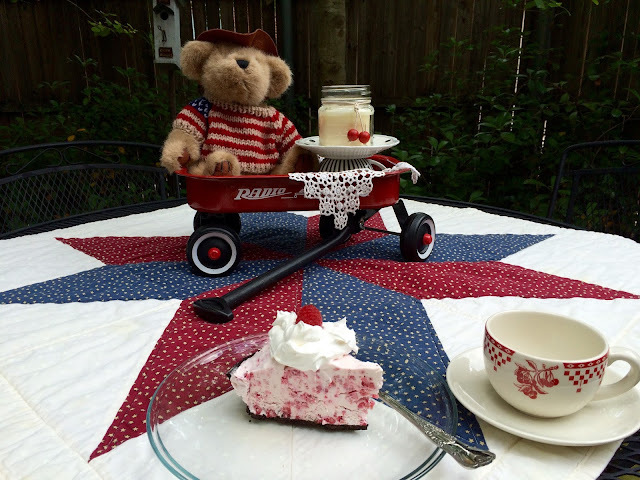 Love your sweet setting with your darling bear in the wagon and the special cup from Deborah. The candle looks nice on the lift you created. The perfect first day of summer setting. I adore your fence decor with the flowers. How cute is that??? Glad your begonias are making a comeback from the storms we had. Thanks for sharing the recipe. Loved how you incorporated gifts from blogging friends in this week's vignette, Kitty. Your raspberry whipped pie is the perfect treat for the summer. I'm drinking David's Tea's Raspberry Cream Pie Rooibos while reading your post. I'm glad that your plants are thriving. I tried to grow some flowers indoors and was excited to see some green shots...but I forgot to water them for a few days and now they're dead. Whoops! Hi Kitty. Oh I love the adorable table vignette. The darling wagon and bear, your quilt is beautiful and the cup and candle makes it picture perfect for the Fourth of July. The pie sounds and looks so delicious and sure works for this hot weather we are having. Thanks for the recipe, I have time to buy what I need and make it for the Fourth. This pie sounds so delicious! I love no-bake desserts in the summer as it quite hot here in Tennessee, too! I think I just may have to copy this one down to give a try sometime this summer. :) And I must say, your tea cup is a beauty! I love the way it looks on your gorgeous quilt! Thanks for sharing! Enjoy your week! Your dessert here looks wonderful, Kitty. Raspberries...I am planning on doing up some of Betty's raspberry jam this week with one of my grandsons. My shelves are bare. I'm going to make some of Betty's pineapple jam soon as well. That I have never done before. I love your cute display in the wagon, very creative. How precious is that little bear in such a darling wagon...on top of your BEAUTIFUL Big Star Quilt topper!!! Super Special Setting...then you add that yummy pie & you've got a real winner. The teacups are wonderfully delightful to see...so creatively displayed, too. Love every inch of this display! Hi Kitty, been missing for quite a while but I'm back. This dessert, my mom used to make and I can say we devoured it every time. Yummy! Kitty, this looks divine and I wish I had a piece right now! I'm sure it's delicious and so refreshing for this heat we have. Thanks so much for sharing! This looks like a wonderful, cool dessert for summer, Kitty. Have you ever tried using real whipped cream in place of the Cool Whip? I think I'll pin this and try that. We have raspberries from our own garden this year, and lots of them! Your table setting looks pretty and summery. Oh no! I was going to make Stephanie's raspberry pie, and then I saw this one. How to choose?! I guess I could make both, hee,hee. Love raspberries! Your dessert looks perfect for a hot summer's day. And I know no one would complain if I had two raspberry pies for July 4. Love your little vignette. Everything looks so sweet together. Nice your flowers and thyme came back. I love to use fresh herbs from the garden. Now this looks like the perfect pie for the 4th of July! It looks delicious. Thanks for sharing and linking Kitty. Why is it every time I visit your lovely blog, Kitty, I ooh and aah over the pretty teacups and am always salivating at your delicious cooking. 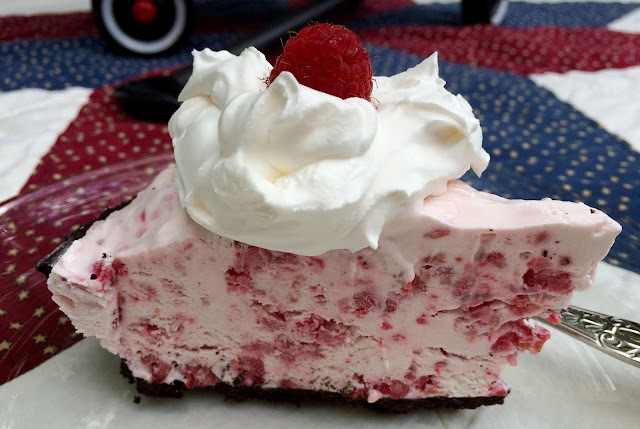 Your raspberry whipped sensation pie looks.....well.....delectably scrumptious! Such a sweet presentation and dessert to match! Another yummy raspberry dessert! It looks so delicious and refreshing too! Stephanie also had a raspberry pie on her blog this morning! Can't wait for the fresh berries to arrive! Love the tablescape as always! I couldn't help but notice the little angel guarding your beautiful plants! How sweet! Have alovely day Kitty! This sounds so very refreshing! It has been very hot this summer and I have been trying to come up with things that I will not have to use the over. This sounds like a winner! Oh yum Kitty! Raspberries are my favorite fruit. I have got to try this! Love your teacup. I have a few dishes that match it. You know me and my cherry fetish. :) Thanks for sharing with SYC. Your pie looks delicious. I love cool refreshing pies like that! My mother made them frequently. Adorable and clever vignette also. Happy to see that you joined us today at TOHOT! Sorry to miss seeing you at lunch today-but I will catch up with you soon! Oh my the pie sounds divine, especially with raspberries! I'm going to make it this weekend, thanks Kitty! You can sign me up for this! It's so funny because yesterday I was trying to make up an original pie idea based on the lemon ice box pie we all make. I was thinking of berries with this combination. I guess there's no original idea. Right? I'm going to make this! My family love Cool Whip pies. I will be trying this one soon! Lunch today was delightful. Thank you for making the trip. Oh Kitty, I'm so excited to see this post!! My mom and I have been making this recipe with strawberries for years! It's one of our favorites, but I never thought of using any other fruit with it. This is a great idea, and I do love raspberries, blueberries, and blackberries, too. Yours looks so refreshing to me; the weather is DREADFULLY HOT and dry here. We can barely stand to be outdoors. I'm just WILD about this pie - certainly does look refreshing. If we were neighbors, I'd be more than happy to help you eat it up. =) Thanks so much for sharing with us at Weekend Potluck. Enjoy a wonderful weekend. I added another photo of the pond being cleaned out! Your Raspberry Whipped Pie looks fantastic, wish I had a slice right now. Have a great weekend and thanks so much for sharing with Full Plate Thursday. Oh I had this years ago and am so glad to have the recipe Kitty! Thank you so very much for sharing this wonderful post at Thoughts of Home on Thursday. Your pie does look cool and refreshing. 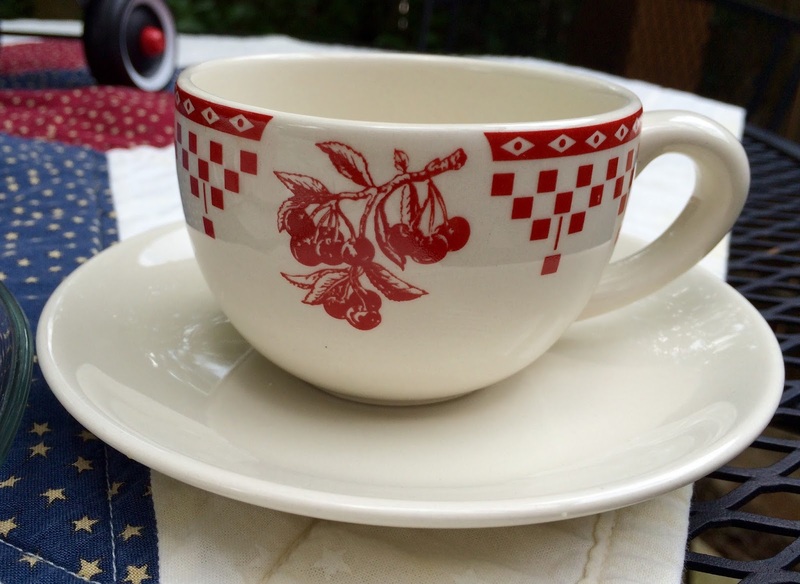 Clever use of a vintage-style diner cup and saucer. 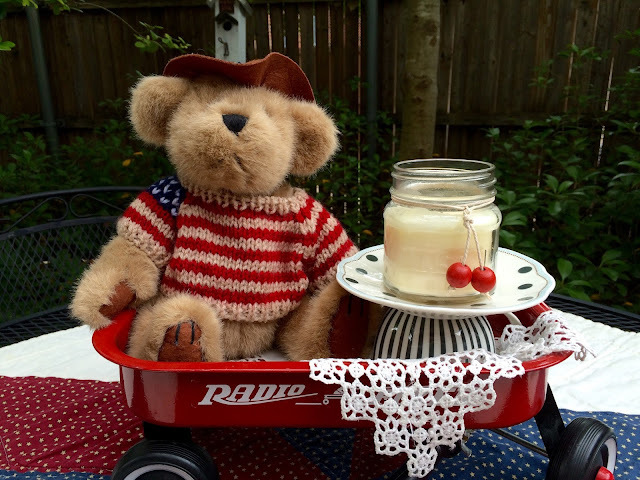 Your adorable vignette makes me realize that the 4th of July is rapidly approaching. Love that little wagon and the bear. What a cute way to decorate for the 4th. That pie looks yummy. I am hosting my community group for dinner tomorrow evening, and that dessert looks like the perfect ending for our meal. Only thing is, I'm going to use cherries instead of raspberries. We have 5 cherry trees, and they have all produced bountifully this year. I'm sure the substitution of fruit won't matter. What do you think? Your pie does indeed sound like a refreshing way to end a summer meal. Totally cute! Loving the pie and how you styled your outdoor table. The wagon and bear add such a adorable americana feel that I just love. Thanks so much for joining the DI & DI Link party. Have a great week!